1/2" Impact, Medium size Ball Pein Hammer, 1/2" End Wrench, 5/6 12 point End Wrench, 1 1/4" Impact Socket, 1 5/16" Thin Wall Impact Socket, Yoke Puller is [Optional]. 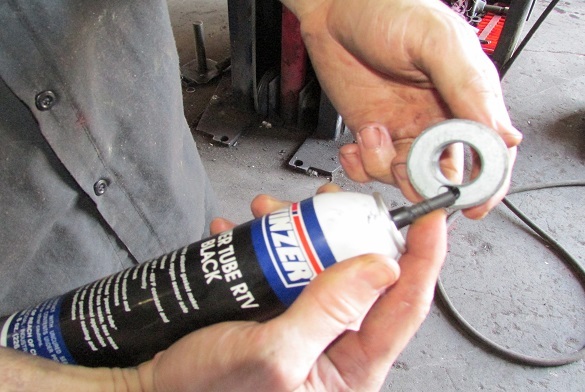 Locktight, Black Silicone, WD-40, and Brake Clean. These are the Parts you will be replacing. 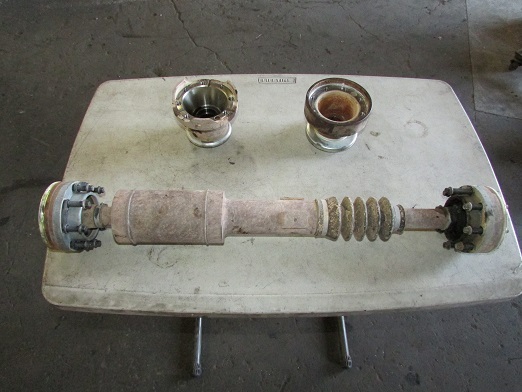 The picture below shows you the old OEM Driveshaft and Yokes. You will be Installing the Parts you see in the Picture below. 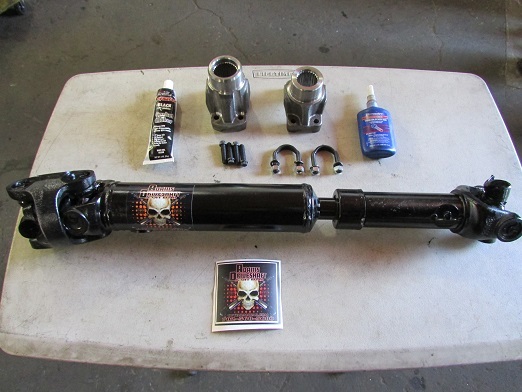 Adams Driveshaft Rock Crawler 1310 CV Driveshaft, Dana 44 Pinion Yoke, T-case CV Yoke, 1310 U-bolts, and Four 5/16 12 point Head Grade 10 CV Bolts. Note:The silicone and Locktight does not come with the driveshaft it is only pictured to show the importance of using these so you will not have a leak, or a bolt come loose. Thanks to our Customer Eddie Ortiz for letting us use his 2 Door JK for the Install. 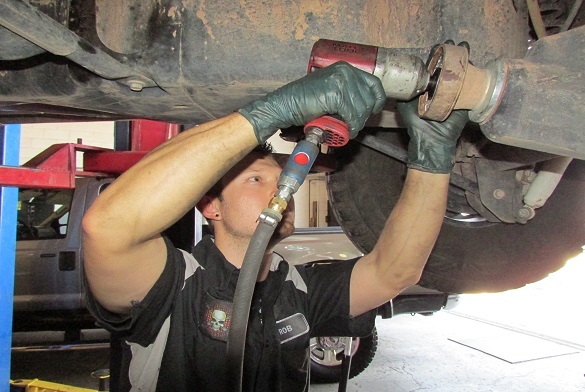 First you will need to take out the old OEM Driveshaft by using your 5/16 12 point end wrench. 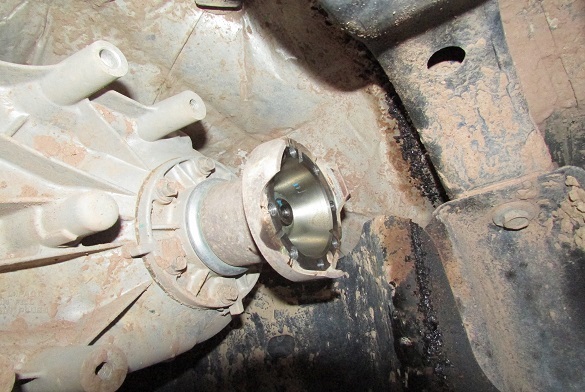 The OEM Driveshaft uses the same bolts Front and Rear. 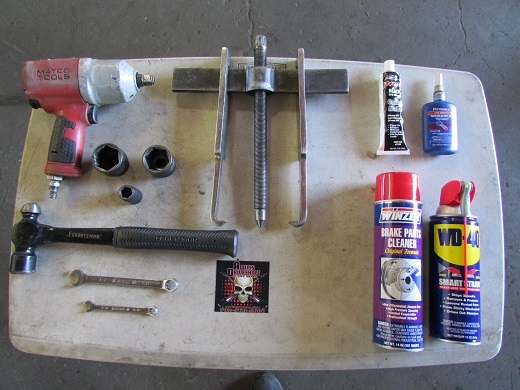 You may need to spray some WD-40 on the bolts and yokes to help you remove them if they are rusted. 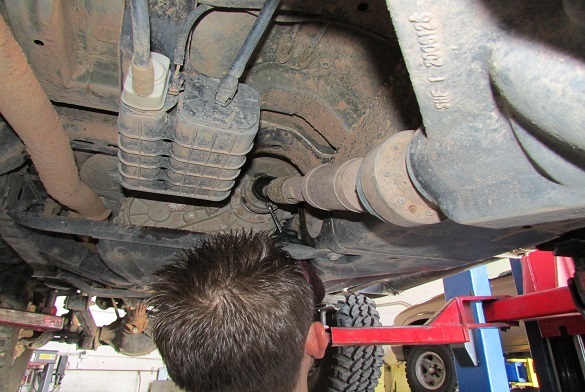 Next you will need your Impact and the 1 5/16" thin wall socket to remove the Dana 44 Pinion Nut. 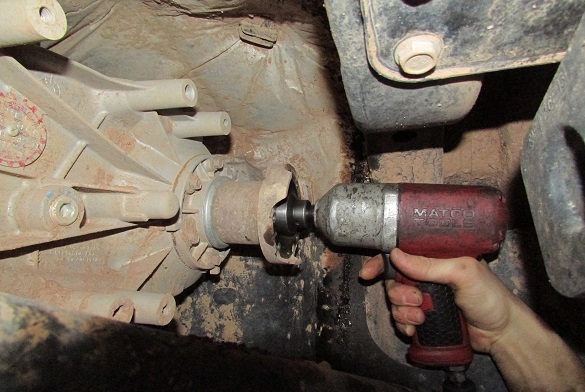 Using the Medium Ball Pein Hammer Lightly tap on the back side of the pinion yoke in order to remove it. 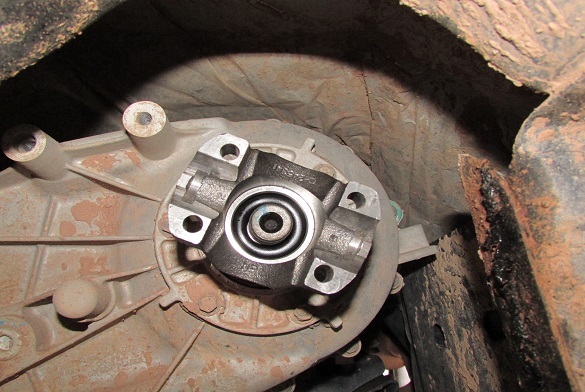 Depending on how hard the yoke comes off, or mileage you may need to replace the pinion seal at the same time as you install the new yoke. You could also use a Yoke puller instead of a Hammer if you have one handy. 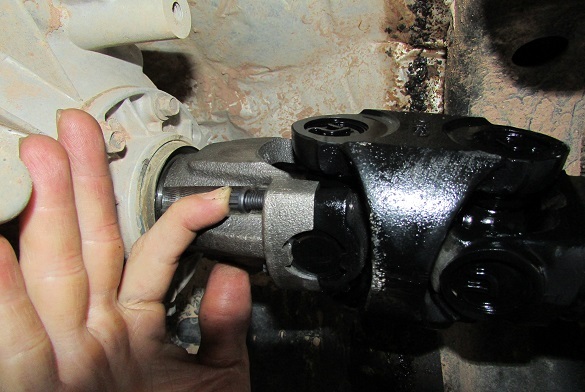 Lightley Tap the new dana 44 pinion yoke on the rear differential with your medium size ball pein Hammer like the picture below shows, being carefull not to hit the threads, or the splines. 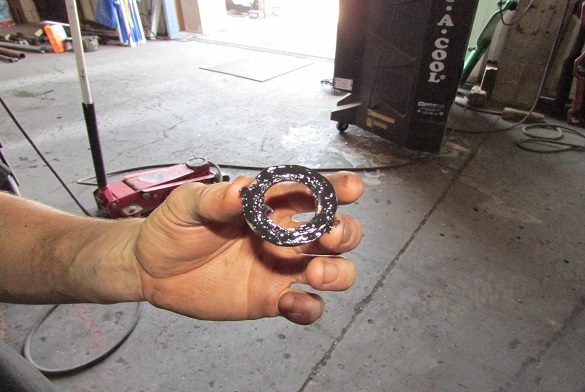 Install the Black Silicone on the bottom side of the Pinion Washer like the two picture's below and install the washer on the pinion with the silicone facing towards the differential. 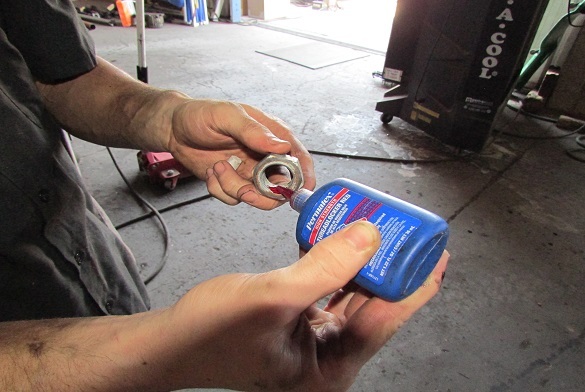 After installing the washer then apply some Red Locktight to the inside of the pinion nut and thread it on the pinion threads. 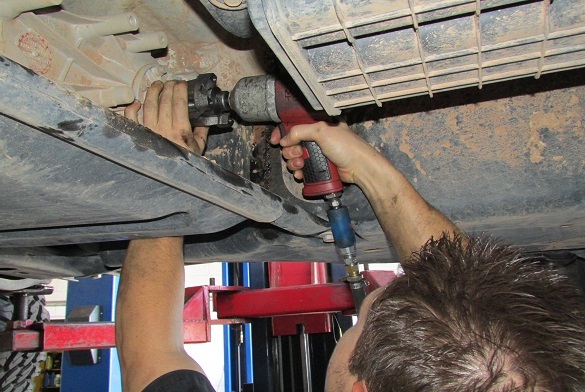 With the Impact gun tighten down the pinion nut until the socket comes to a stop. 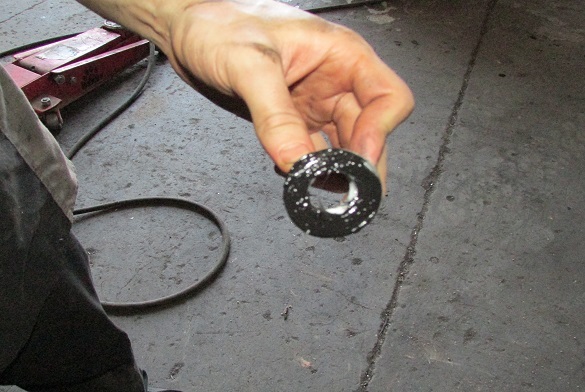 NOTE: DO NOT KEEP TIGHTENING THE PINION NUT AFTER THE SOCKET HAS STOP. 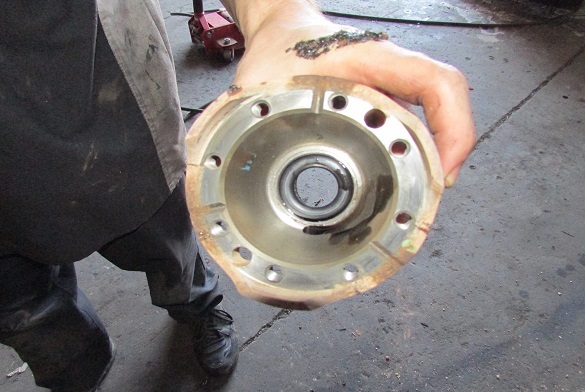 If you keep tightening the nut you will over crush the crush sleeve and the pinion bearings will burn up. 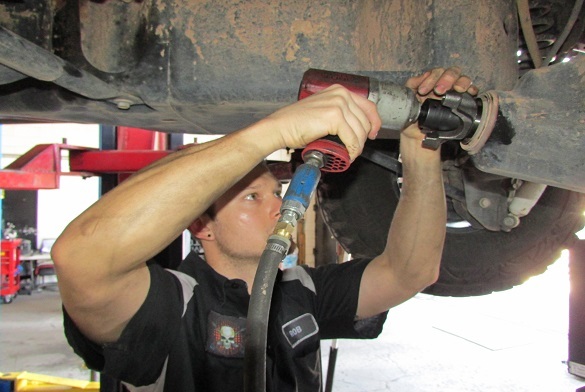 If you are unsure of this step please give us a call at 702-568-5680 and we would be glad to answer any questions you have, or consult a professional mechanic. 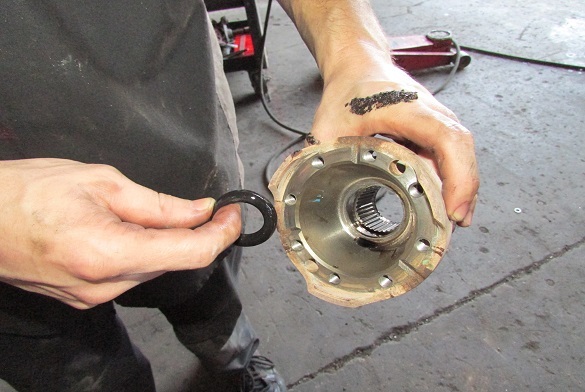 Check to make sure that there is no play in or out, or up and down on the pinion yoke. If there is some play then the yoke has not been tightened down to the crush sleeve yet. Continue tightening until there is no movement in the yoke in or out, or up and down. 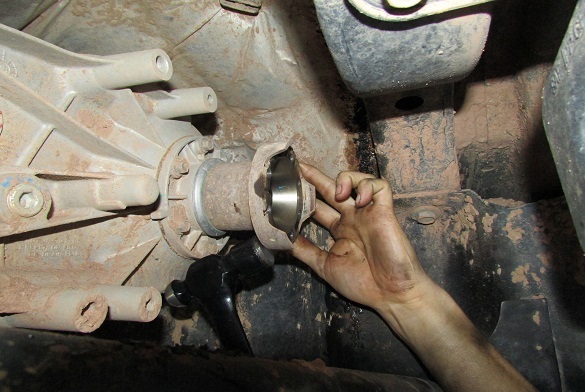 Now it is time to change the Transfer Case yoke by using the Impact and 1 1/4" Impact Socket. Take your Hammer and Tap off the T-case yoke. You could also use the Yoke Puller if you have one. 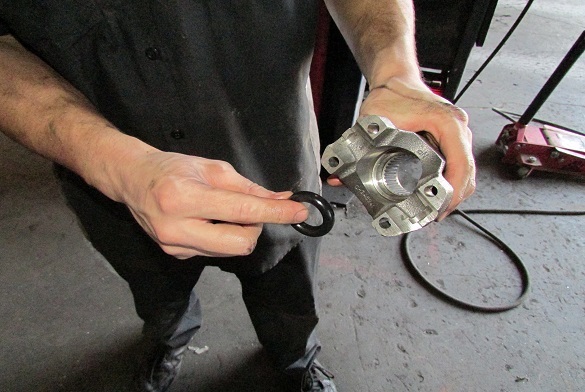 Notice that in the old T-case yoke there is a thick O-ring, take out this O-Ring like the picture shows below so you can install it in the New T-case Yoke. Install the O-ring that you took off the old yoke into the new yoke before you put the yoke on the T-case. 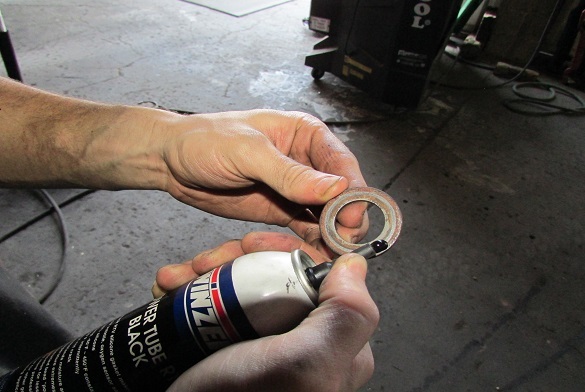 Put some Black Silicone on the back side of the nut like the picture shows below. 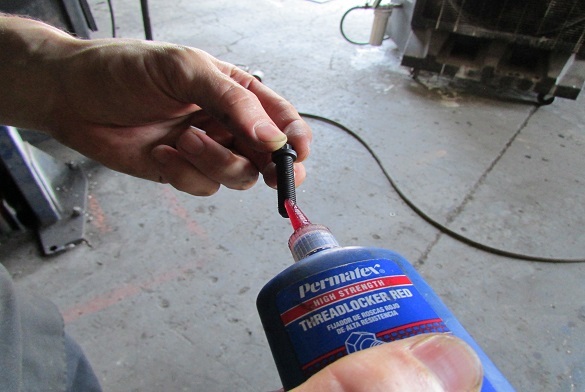 Put some Red Locktight on the threads like the picture below shows. 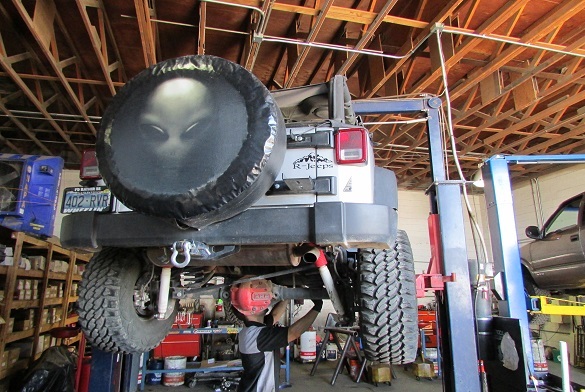 Tighten the transfer case yoke until socket stops. 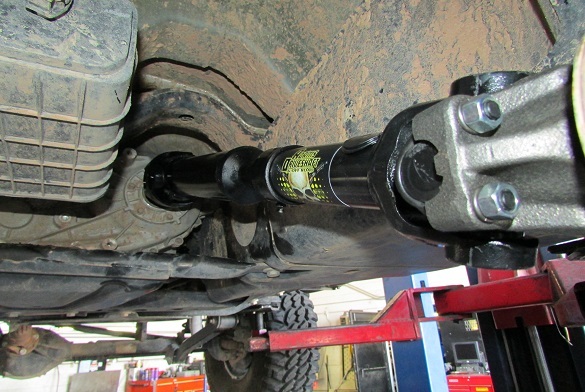 We called and talked to four different Jeep dealerships and they all recommended that the torque Settings to be between 120 to 190 foot pounds. We set ours to 160 FT Pounds. 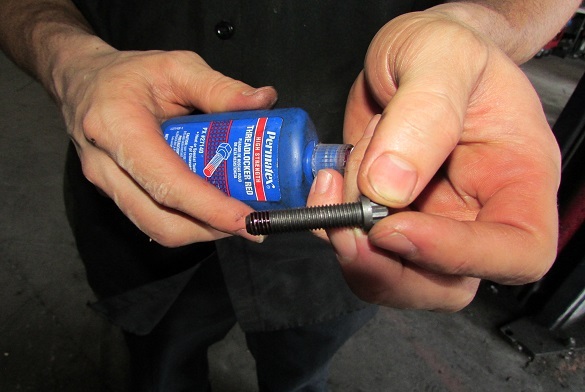 Install Red Locktight on the CV Bolts like the picture shows below. 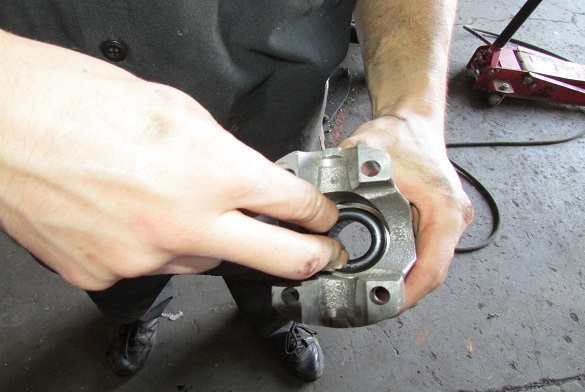 The CV Bolts are installed through the back of the yoke and threads into the CV Kit. You will need your 5/16 12 point open end wrench for these bolts. 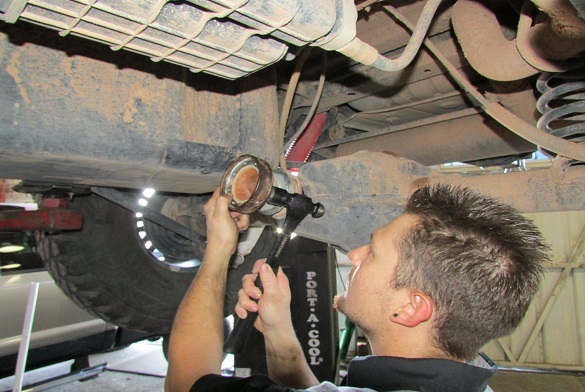 Remove the black tape off of the rear u-joint. Be carefull not to drop the cap off the u-joint. Install the rear u-joint into the Pinion Yoke making sure that both u-joint caps are sitting between the tabs on the yoke like the picture below. 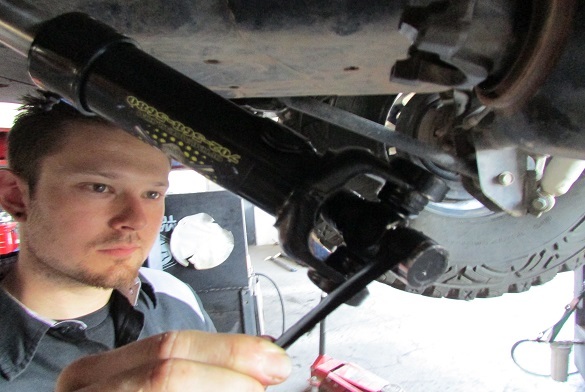 Take your 1/2" open end wrench and tighen down the u-bolts. 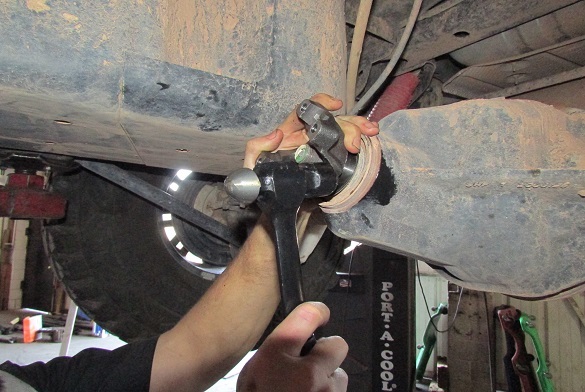 Make sure that when you are tightening down the u-bolts that you tighten then down even. 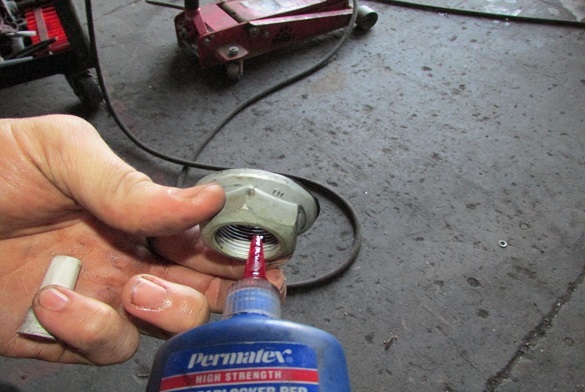 Tighten the nut down until it feels snug, then go a 1/4 of a turn and thats tight enought. The lock washer will hold the nut tight. 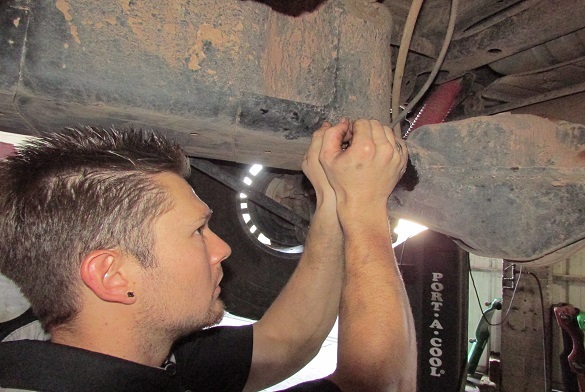 Note:If you over tighten the u-bolts, or tighten then uneven then the u-joint will fail and could cause the driveshaft to come out. 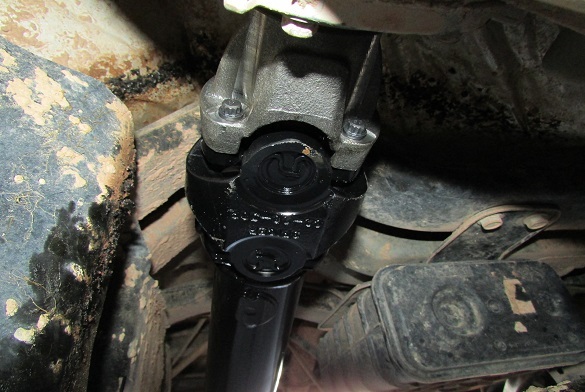 You now have Installed a New Adams Driveshaft Rock Crawler 1310 Solid Spicer 1310 CV Driveshaft. 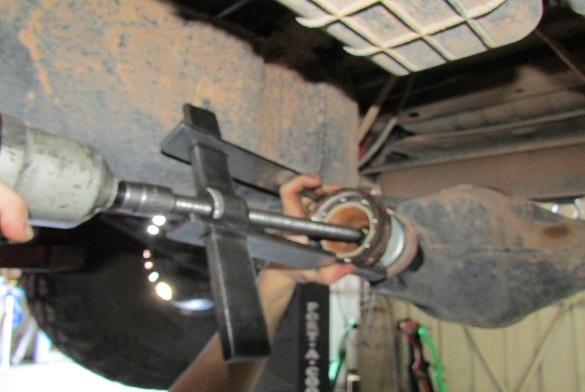 This is one of the Strongest Driveshafts, and made with the best Components Possible by Spicer and Neapco. 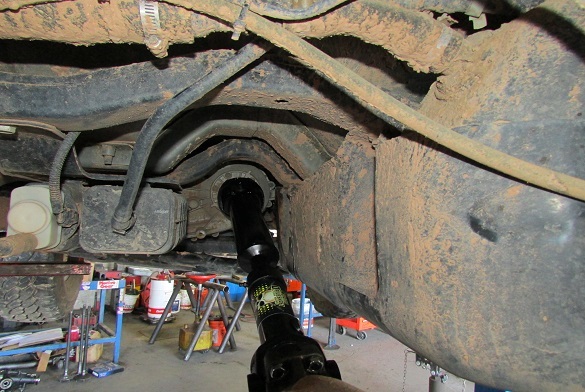 Thanks for Choosing Adams Driveshaft for your Driveshaft needs. If at any time you have any Questions please call us between the hours of 8:00 am to 5:00 pm Monday thru Friday. If it is the weekend please send us a E-mail and we will get back to you as soon as we can. 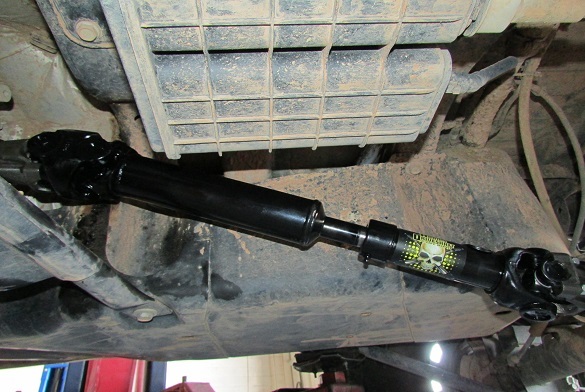 Special Thanks to Robby Adams the Owners 27 Year Old son for doing the work during this Driveshaft Install.